On November 30, the church celebrated it’s 100 years’ location at 9 Menemsha Crossroad. Harriet Otteson gave a talk at a dinner commemorating the year. She noted that she found that in 1910, when the church was rededicated (on December 4) at its new location, it was the 100th year of Methodism in Chilmark. The first meetings in 1810 were held in people’s homes and there were 12 members. In 1910 there were 74 members and about 50 attended worship regularly. Prior to the church’s relocation from Middle Road, two services were held on Sundays, one at the Middle Road church and one in the Menemsha School. Harriet also explained that the relocation of the building coincided with the development of the Harbor at Menemsha and the increase in the fishing industry there. The site of the parsonage was given by Avis Mayhew, Alice Adam and Benjamin Tilton from West Tisbury. E. Elliot Mayhew provided the site for the church . He owned a store near the location of the present Tavern and lived across the street in the “Kurth” house that was torn down to accomodate the new school. The Ladies Aid Society raised $1,594 for the moving of the church and the parsonage. Frank Tilton, Ernest Flanders, and Albert Reed served on the church moving committee. Tilton’s grandaughter, Stephanie Rossi, said her grandfather lived in the “Capt. Leonard West/Frank Tilton/Greenbaum” house in Menemsha. When scraping the church the painters uncovered the scar where the church was “flaked” for moving. 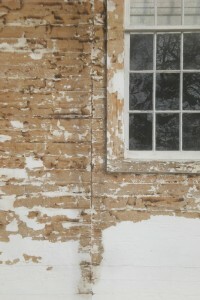 Note "flaking" seam left of window. 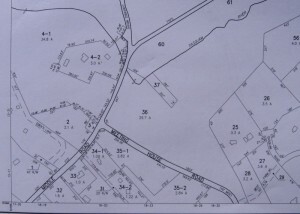 The location on Middle Road from which the building was moved was most likely parcel 3 on map 12 of the town’s assessors’ maps. (see below) Just to the north of this small lot, in the Silva’s field, were the “Shed Lots”, small parcels that individuals owned on which they build carriage sheds for sheltering horse and carriage during church services. Those real estate interests were cleared prior to the Martha’s Vineyard Landbank’s purchase of the field. The town’s Master Plan Historic Resources section has good on the site of the old town center on Middle Road. 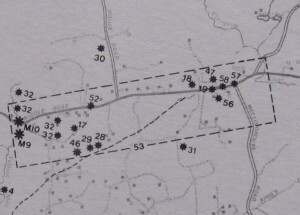 I have a copy of an old map showing a church at Abel’s Hill, beside the cemetery. It wasn’t Methodist, but it predates the middle road locations. Experience Mayhew preached there in the early 1700s, his father, John Mayhew (number 32 in Banks history) was the first circuit minister who lived in Quansoo , who became a preacher at Boston’s South Church and spoke against the King’s Stamp Act, just prior to the Revolution. His Son, Experience, wrote a detailed ethnology of the indigenous Wampanoag conversions, which is available in the West Tisbury Library. Including Abel, who was his first convert to Christianity. In 1694, Matthew Mayhew wrote “A Brief History of the success of the Gospel among the Wampanoag of Martha’s Vineyard” in Chilmark. He mentioned twenty different languages were spoken at the time. And suggested that the Crown should learn from their example of local assemblies open to all citizens, Hashawockamuck, Aquinnah, Nobnocket, for example, were the tribal centers where all local affairs were discussed, and many early Christian conversions took place there and in private before any standing churches. Many of the founding principles of our country came from those discussions. Freedom of assembly, government by the people, regional conferences, were discussed up-island, at fireside before 1700.